Hyacinth Caribbean Dream (Hyacinthus orientalis) has fantastic pale blue flowers that open as a lilac blue and change as they age to eventually become a soft silvery blue colour, giving an extra dimension to this beautiful variety. Enjoy these highly perfumed blooms in pots, containers or garden beds. Hyacinths are highly prized for their colour and fragrance in the Spring garden. Ideal for growing in pots to bring inside to enjoy their beauty, these bulbs also grow well in garden beds or borders where wafts of fragrance are sure to delight in early Spring. Hyacinths need a chilling period so in warmer climates ensure they are refrigerated for a 6 week period before plantings, and for long lasting blooms a full sun to partly shaded position will ensure the beauties will perform to their fullest. damage from frost if in pots outdoors. Watering: Water well after planting but not again until after leaves emerge unless particularly dry. Give regular deep watering from when the buds appear until stems die down. Fertilising: Manure, blood and bone or complete fertiliser should be worked through the soil before planting. Soil must be well drained and enriched with organic matter. Soil: Well drained, rich in organic matter. Lifting & Storage: Once the foliage of the hyacinth turns yellow they need to be dug up, dried and cleaned with a cloth and stored in a dry and airy place until the next season. 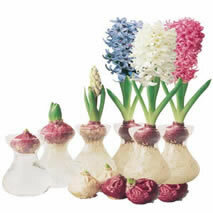 Pests: Hyacinths are generally not susceptible to pest and disease problems. Tips: For best results in the next season remove spent flower stems and continue to water and feed the plant until all the foliage starts to turn yellow and die down. Potting Hyacinths: Hyacinths grow particularly well in pots. Choose a pot at least 15cm deep so you can apply a good base of potting mix to the bottom of the pot. Place the bulbs 10 cm from the surface of the potting mix. Water well after planting and place pot where it will receive at least half a day of sun.